Dan was on Good Morning America, Friday April 4th to discuss Gail Gerlach, 56, charged with manslaughter for shooting and killing Brendon Kaluza-Graham, as he attempted to steal Gerlach’s car. Gerlach claims that he thought he saw Kaluza-Graham pointing a gun at him and believed his life was in danger. 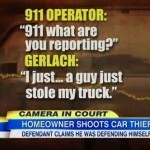 Prosecutors contend that it was physically impossible for Gerlach to see the victim as the car was driving off and Gerlach firing his gun was reckless and unnecessary. Says Dan, “To argue self-defense – that you felt in danger when you used your gun on someone who was driving away – seems like a real long shot…But in practice, getting a jury to agree unanimously to convict someone for shooting at a man who was stealing his car out of his driveway could be really hard.” Watch the full clip here.